In light of Údarás na Gaeltachta, statistics releases today which show an increase in the number of jobs created year on year, Indepndent TD for Donegal Thomas Pringle has called on Údarás na Gaeltachta to make it a condition whereby companies must recognise its workers’ union membership before the they can access Údarás grants which Deputy Pringle says is “essentially state money”. 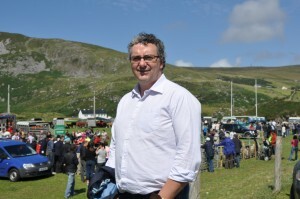 Deputy Pringle further stated “it’s not enough to create jobs in much needed areas like County Donegal. They have to be good quality jobs and with the appropriate conditions attached including union recognition by the employers. “I believe it’s time that Údarás, which offers state grant money to these companies should make union recognition a priority. 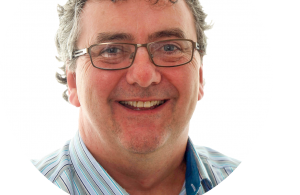 “Just earlier last year alongside Cllr Michael Cholm Mac Giolla Easbuig, I attended a strike organised by staff at the Rapid Action Packaging Ltd. in Letterkenny where I gave my full support to the workers. They had voted overwhelmingly in favour of industrial action in a ballot taken by the SIPTU trade union due to the continued rejection by management of the company to recognise the workers’ union. “We really shouldn’t have to face the issue of basic workers’ rights in 2019 but unfortunately with Fine Gael in power and Fianna Fáil propping them in Government this year will see a the continued struggle for basic rights like union recognition. “If job quality was important to Údarás then making union recognition a stipulation for companies shouldn’t be such a difficult task. 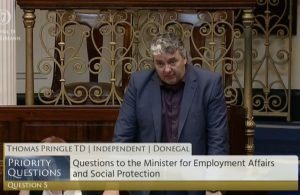 “I intend to raise this issue with the Minister in the Dáil shortly and will seek commitments from Fine Gael for a prioritisation of workers’ rights in Donegal and across the country” concludes Pringle.